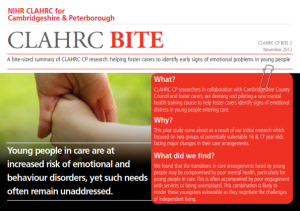 The Transfer of Care at 17 (TC17) research project identified a toxic cycle wherein mental health problems fed placement breakdown which, in turn, exacerbated mental health problems. In response to a need identified by this research, we plan to design and pilot a mental health training programme for foster carers, so that they are better equipped to detect the early signs of emotional and behavioural disorder in children. This would help reduce placement breakdown, improve mental health and emotional wellbeing and enhance the future life chances for these young people. Involving young people is an important part of our work. We are working with young people in care to produce a short animated film to use as a training resource. Design and pilot a close observation and recording procedure, based on the symptoms covered in the training. Essential to this will be a review of the symptom profile with a mental health professional after the initial observation period. This will improve early access to appropriate treatment. Our partners in this project include NHS Cambridgeshire, CPFT, Cambridgeshire County Council, Cambridge Film Consortium, Cambridgeshire Youth Offending Service. My Name is Joe is an animated film produced by 11 children in care, which is part of the CLAHRC project to develop mental health training for foster carers. The young people involved in the making of the 4 minute film have all been nominated for special awards at the Childrens’ Service Annual Awards. You can see My Name is Joe on You Tube. My Name is Joe: Behind the Scenes is a short documentary which gives insight into the background and the making of My Name is Joe. In August 2013, another group of young care leavers from the Cambridge area gathered for an intensive 4-day animation summer school to make a short film about the expectation and the reality of leaving local authority care. Supported by a team of professionals, the group produced Finding My Way, a powerful animated documentary short. A companion film, Behind the Scenes, takes us through the project from the initial idea to the unique finished product. Both My Name is Joe and Finding My Way are being used nationally to train foster carers and social workers. In February 2014, Finding my Way won the award for Best Documentary in the 15-18 age group at the 7th British Film Institute (BFI) Future Film Festival in London.